Home / Kote Lajan Petrokaribe A? Where is the Petrocaribe Money? This simple question has captivated the Haitian population’s imagination. All seem eager to share their rendition of the question, and with the repetitive nature of cyber-phenomenon, the issue is isolated, apparently shielded from the distractions of partisan politics. Yes, what has become of the billions that could have been used for the country’s development? How were the funds used? Who spent all that money? Songs, comic strips, video vignettes, articles, and the inevitable multiplication of “know-it-all-experts” who suddenly, on radio and TV programs, remember the existence of poor people. ‘These funds were earmarked for this, should have been used for that,’ as if they really care about their poor neighbors. In reality, they are merely trying to get ahead of the phenomenon, and reestablish themselves as the only voices which count in the country. Human-rights experts, anti-corruption experts, democracy experts, all in a frenzy, trying to recapture a narrative, running away from them. But can a complex social or political phenomenon be explained in simple terms? One of the best ways to do this: break it in small independent parts. So, we will start by taking a look at the Petrocaribe program, its goals and objectives. The government of Venezuela, under the Chavez presidency, decided to help Caribbean nations with their energy needs. The objectives were simple: offer oil at a preferred and affordable price. The expected results were clear: control the negative impact of energy on these small islands’ economy. Haiti joined the program in 2006, and since then has been granted loans to purchase gas in a very advantageous way. Avoiding an in-depth presentation, we’ll describe the transactions as follows: Venezuela offers a loan to facilitate the purchase of the gas. Part of the loan is repaid right away, while the balance can be structured as a long term loan, at a 1% interest rate. One extra benefit stemmed from the actual climbing price of oil. Indeed, a cap of $100 was put on the price of a barrel, with the balance of the cost left to the benefit and discretion of the receiving country. The Preval government decided to sell the gas to established Haitian distributors at market price, putting the balance in a special fund, which according to Preval collaborators, was to subsequently repay the debt. Towards the end of the Preval presidency, Port-au-Prince suffered the tragic earthquake of 2010. Venezuela, as part of its aid package, expunged Haiti’s existing debt, thus gifting the millions accrued up to that point. During the Preval presidency, Haiti paid approximately 40% of the actual cost of the gas used. Furthermore, since the gas was sold at current market value, millions were accumulated in the government’s account. What impact did the program have on the Haitian government? It is needless to say that the Preval and Martelly governments had a more stable budget and depended less on international agencies that allocate illusionary, but often never-disbursed funds. So all of a sudden, funds were available. However, we should note that Haiti’s inclusion into this program came at a political cost to Preval and its collaborators, since “the internationals” did not desire financial independence for the Haitian government. Though very shy in development projects, the Preval administration did plan some construction projects, and use some of the money as part of a few disaster relief events. Of course the 2010 earthquake should not be included among these disasters, since other funds controlled by the International Commission for Haiti’s Reconstruction,, much more than those generated by Petrocaribe, were offered by the populations of the world. All infrastructure projects planned by either of the two governments that managed the funds, though rich in rhetoric, were short on outcome. Nonetheless, sums were disbursed. A long “unofficial” list is circulating, including friends of Preval and Martelly suspected of having benefited from the looting of Haitian government’s coffers. The Preval administrations had a reputation for stimulating the financial sector and creating modern infrastructures inviting to foreign capital. In the process, both in 1997 and 2006, Preval’s friends were given the lion’s share of available resources, to establish banks and other financial instruments, thus establishing a solid grip on the Haitian economy. Though empowered by Petrocaribe money, post-2006 Preval administrations ignored the labor-intensive projects touted in 1994 and 1997, consistently choosing privatization over popular job programs. Under Martelly, the national budget grew steadily, spanning from $300 million under Preval, to over a billion a few years later. Most of the projects focused on infrastructure development. Some more obscure “tech” related industries were promoted. Petrocaribe money-looting was systematized, and the few social and economic programs seemed to have been used to create smoke screens to divert funds, leading to the Petrocaribe movement. 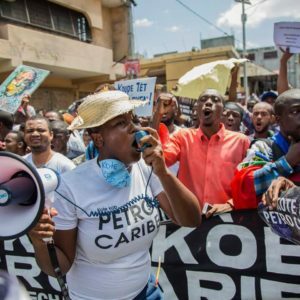 Where Did The Petrocaribe Movement Come From? Anyone who followed the 2016 elections and listened to the different campaigns’ messages will tell you that Fanmi Lavalas, the party of former President Jean-Bertrand Aristide, focused on the very themes now central to the people’s demands which highlighted the huge sums of money looted, stolen funds left as debt and burden to the nation; funds that could and should have been used to the benefit of the population; “health and education funds” that have been diverted and stolen, all facilitated by blatant lies designed to confuse and distort. This message resounded in the poor sectors of the population, but was ignored by the “collaborating” mainstream media. 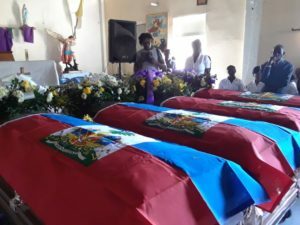 Yet, this silencing of Fanmi Lavalas’ message in the media did not affect the people that count – the millions of poor people hopeful that one day honest people will take the reigns of Haiti, and implement a truly progressive agenda. The spectacle of millions of Lavalas supporters — Port-au-Prince’s mainstream media reported millions — proudly marching through the streets of Port-au-Prince as the “Dignity Caravan” up until the very last minutes of the campaign, must have left its mark. So it is not surprising that one more effort is made to coopt a message that has been hijacked before. In spite of cooptation efforts, the focus on corruption has continued to unite the population and to steadily enlarge the tent. All, even some who participated in the looting, are calling (or pretending to call) for justice. So, when it became obvious that the current PHTK president,  who participated in the looting, could not preside over Petrocaribe trials, people started to call for his resignation. How Did The Government React To Petrocaribe? At first, the new president, Jovenel Moise, pretended to want to get to the bottom of the affair. Faced with billions disappeared and a current budgetary deficit, the government had no choice but to pretend to hear the cries of the people. However, this posture did not last long. When the attempt to use a change of Prime-Minister did not appease, the government started to use force. The steady spread of political activism centered around Petrocaribe prompted immediate, but not well thought out governmental action. The continuous demonstrations culminated in huge coordinated demonstrations in all the big cities. So, the government opted to establish a reign of terror. Paramilitary groups were mobilized, along with the police and the army. The objective was to inflict pain and terror. Militants were disappeared, foreign mercenaries were recruited, and along with disappearances, a steady diet of sniping started to literally blow demonstrators’ brains off, culminating in the scandalous sniping of a toddler-holding young mother, where both of them were shot in the head by a cowardly hiding sharp shooter. An attempted return to the hideous days of totalitarianism is clearly looming in Haiti. 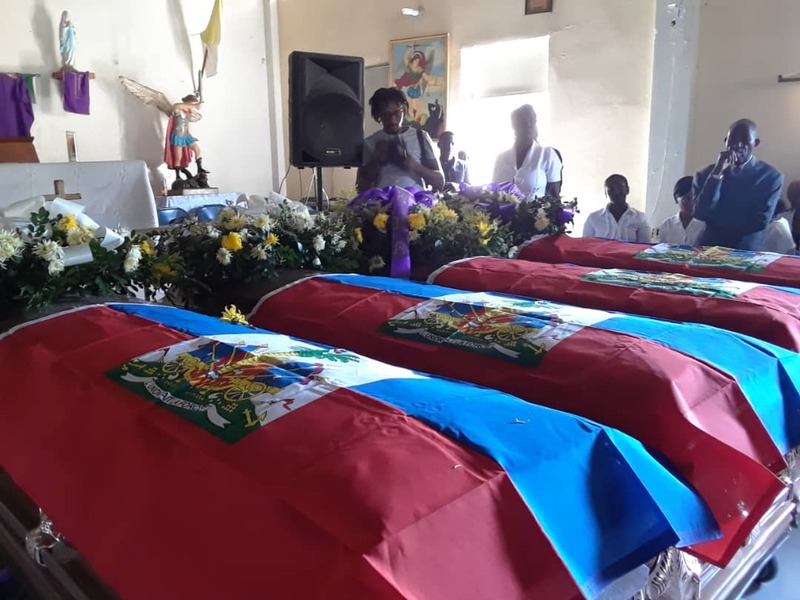 What makes for a more distressing situation, is the fact that the totalitarian regime has the support and the blessings of international institutions which in the past pretended to wish a law-abiding government in Haiti. The UN put an end to their MINUSTAH project in Haiti, and started a new project, MINUJUSTH, supposedly focusing on justice. MINUSTAH was supposedly designed to facilitate the pacification of the Haitian environment. It was supposed to favor “diplomatic” solutions and avoid politicizing all aspects of life. Yet over its many years of existence, we observed a systematic deterioration of every aspect of life in the Haitian environment. Here, we are not merely talking of the gangs that terrorize the society. We are talking of an impossibility to have free and fair elections, thus the denying of the right a people have to choose their leaders. We are also talking of a restructuring of the economy. From attempted privatization of the mineral resources, to new customs laws, to the destruction of small merchants’ wealth through burning down popular markets. These are only two examples of the restructuring that has happened in Haiti under UN tutelage. But in reality, this plan was not merely implemented by the UN, but rather by the Core Group which claimed to have the interests of Haitians at heart, including the OAS, CARICOM, the EU, and all the other globalist organizations intent on “opening Haiti for business.” Part of their plan is to prevent the inevitable next Lavalas government, by promoting globalist sycophants, well versed in parroting the Lavalas agenda, but determined to do the biding of foreign interests bent on controlling Haiti. In order to obfuscate, the illusionists establish false equivalencies. So the current PHTK president, Jovenel Moise, like his predecessor, will not tell you that he did not steal. He will say that like all presidents before him, his government may have abused some of the funds, but that he meant well. He will pretend that his “tough stand” is an effort to protect democracy. However, he will not mention that he consorted with gangs, and campaigned with gang leaders. He will never admit that the looting of state wealth is allocated to gangs and mercenaries to protect democracy by shooting three-year-old baby girls in the head. He will not talk about his promises to foreign interests willing to risk their future, in order to compromise Haitian current and future well-being. He will not tell you that his idea of democracy is a systematic and continuous terrorizing of Haitians, like Martelly before him. We have a responsibility to expose the current Haitian reality for what it is. That the UN participated in this debacle is not our concern. We understand some of the useful aspects of the UN, however we know that in Haiti it succeeded in solidifying apartheid. Yes, this ugly plague of yesteryear South-Africa has reemerged in Haiti. There are two political, economic, social, cultural Haitian realities, systematically reinforced by the UN. Consistent with this design, human rights organizations, diplomats, and the international media seem to only be moved by abuse towards certain classes. When massacres take place in La Saline, they are ignored. When attempted dispossession takes place in poor sectors of the population, it is ignored. When the fatal gassing — yes, poisonous gases have been used to repress demonstrations of poor students on university campuses, it is ignored. UN diplomats are mute. European diplomats are mute. CARICOM diplomats are mute. OAS diplomats are mute. It is as if these lives are not sacred. They obviously value only certain classes in Haiti. They have successfully implemented the divide and conquer desired. The government is expanding its reign of terror, especially since former Western ambassadors are willing to lobby on their behalf. 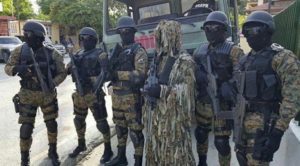 The army created by Martelly, in collaboration with the UN-OAS coalition, trained and armed by Ecuador, is in full repression mode. What is even more appalling is the PHTK use of death squads to intensify the terror. 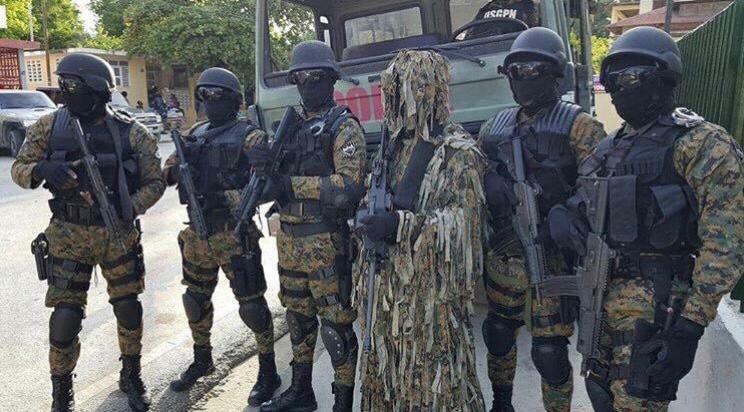 A strange mixture of masked squadrons is roaming the streets, often in unregistered vehicles, shooting at random and disappearing democracy activists. This new terror is “enhanced” by a buying power that can afford the hiring of sniper mercenaries, masked of course, aiming at demonstrators’ heads. When Papa Doc Duvalier established his reign of terror, his henchman were also masked at first, until the terror and Western diplomats’ collaboration, allowed the “Tonton Makout“ the luxury of dropping the mask. Today the terror is blamed on gangs. Some gangs leaders are arrested, but the police chief says that official government officials come to free them and offer them safe passage to their “base,” to continue wreaking havoc. The “paid” media interviews “gang leaders” routinely. Judges, militants and honest citizens protesting are openly intimidated, same as under Duvalier, by death squad night visits, and automatic weapons assaults. Clearly we can conclude that Jovenel and MINUJUSTH continued the Martelly-MINUSTAH job of Duvalier terror reinstatement. Since the writing of this article, the situation in Haiti has continued to evolve. The violence has increased at all levels. No one is safe, and the police seem unable to protect the people, for the criminals are the ones in power. The lies of the campaign, the corruption, the denounced thieves, they are still there, better equipped than the police. So the police, rigged with illegally recruited members, are in limbo. Yet in spite of the increased repression, the Haitian people continue to make clear their rejection of the PHTK. They reject, along with PHTK, all national or international actors that have caused the deterioration of the Haitian environment. They know that the solution must be local. The popular movement is resisting, organizing, teaching, and learning – determined to create a Dignity Caravan with the word “inclusion” central to its motto. They know that to defeat apartheid, they must practice inclusion. And they know that Moise’s PHTK will continue to deny justice to the masses of Haitians…unless the people have their say! 2. Groupe de Bourdon is an organized group of financiers who funded Preval’s presidency campaigns, and were well rewarded for their election time largess. 4. Early in the Martelli administration, an accord that as never ratified by the legislature, engaged the OAS to reestablish the arny, under the guise of “Border Security”. So in Haiti it is not a wall, but a repressive army that kills Haitians. 5. Fierce and feared armed gangs that disappeared opposition members for the Duvalier dictatorship.